Who is the Canucks Best Prospect? During their heyday five years ago, the Canucks most notable prospect to join the big club was Cody Hodgson. However, in recent years, the Canucks have seen players such as Bo Horvat and Ben Hutton play significant roles. Jake Virtanen and Jared McCann also surprised some people last year when they made the roster, albeit in depth roles. After once having a prospect system that would hardly make you raise an eyebrow, the Canucks have finally returned to respectability. However, with Virtanen and Hutton likely sticking in the NHL this season, the Canucks prospect depth has taken a hit. Should that be troubling for a team that finished 28th overall in the NHL last season? Perhaps, but one thing the Canucks brass can gloat about is the overall quality of their top prospects. Thatcher Demko, Brock Boeser, and 2016 fifth overall selection Olli Juolevi are the three crown jewels of the organization. These three prospects all had an outstanding 2015-16 campaign, and will look to build on that in the upcoming season. Ironically, none of them will play in the same league during the upcoming season. Boeser will return to the NCAA for a second season, while Juolevi will likely return to the OHL. Demko is slated to make his debut in the AHL. All three of these prospects are extremely talented, which makes it difficult to assess which one stands above the rest. If all three perform to their utmost potential, they have a chance to turn the Canucks into a playoff contender sooner rather than later. The main question is, which prospect has the potential to have the biggest impact on the organization? Juolevi enjoyed an outstanding past season, his first in North America. He was the number one blueliner with the Memorial Cup winning London Knights, and he played the same role with gold-medal winning Finland at the World Junior Championships. 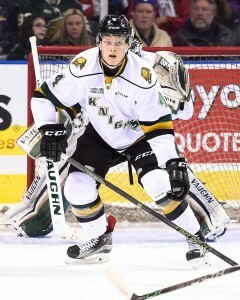 He recorded seven points (all assists) in four Memorial Cup games for the Knights en route to their Memorial Cup victory. Earlier in the year, he registered nine points, (once again, all assists) in seven games for Finland at the World Juniors. Juolevi broke the record for most points at the World Juniors by at 17-year-old defenceman, breaking the record previously held by Ryan Ellis. It is hard to have a season much better than the one that Juolevi had. At the beginning of the 2015-16 season, all the talk about the best defencemen in the draft drifted towards Jakob Chychrun. THW’s Chris Ralph had Juolevi ranked 10th overall during our preliminary draft rankings last summer, which was higher than most had pegged Juolevi. Heading into the draft, the conversation for the best defenceman was between Juolevi and Windsor Spitfire Mikhail Sergachev. Both defencemen have top pairing potential, but Juolevi’s star-studded season catapulted him to the fifth overall selection. Juolevi is the highest drafted defenceman for the Canucks since they took Bryan Allen fourth overall in 1998. The best case scenario for the Canucks is that Juolevi becomes the franchise’s first bonafide number one defenceman. Throughout the Canucks’ 45-year history, the team has never had a defenceman worthy of that title. Juolevi still has lots of work to do before we begin that conversation, and it’s unlikely that he sees regular NHL action for a couple of seasons. Like most prospects, he needs to fill out his frame, but the skating ability and hockey smarts are evident. It will be easier to get a read on Juolevi’s top pairing potential once he turns pro. Here’s another Canucks prospect who had a championship winning season. Boeser and the University of North Dakota Fighting Hawks won the NCAA hockey title after defeating top-ranked Quinnipiac in Frozen Four. In the final game of the tournament, Boeser led the way with a goal and three assists, leading his team to a 5-1 victory. 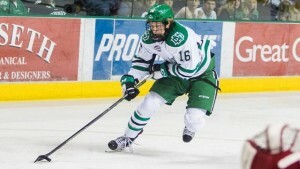 Boeser was outstanding as a freshman, leading the Fighting Hawks with 27 goals and 60 points in 42 games. His freshman totals surpassed those of two prominent Fighting Hawks alumni, Johnathan Toews and TJ Oshie. Despite accomplishing everything he could in his first season with North Dakota, Boeser has decided to return to the University for a second season. He’s following in the footsteps of other Fighting Hawks alumni, including Toews, Oshie and Parise, who all returned for another season with the University. So far, Boeser has flashed at that top-six scoring potential that the Canucks desperately need. The best-case scenario is that Boeser turns out to be the next Joe Pavelski. The two players share similar statistics from their time in the USHL. After scoring the second-fewest goals in the league last season, it’s a little troubling that the Canucks don’t have more scoring talent in their pipeline. They are in for another long season if some of the younger players on the roster don’t step up and start scoring. Boeser provides the best shot at a scoring succession plan to the Sedins. Perhaps it is because Demko could be even better than the former Canucks netminder. He did break Schneider’s Boston College single-season shutout record earlier in the year when he recorded his ninth shutout of the season. He finished his third season at Boston College with 1.88 GAA, a .935 save percentage and 10 shutouts. 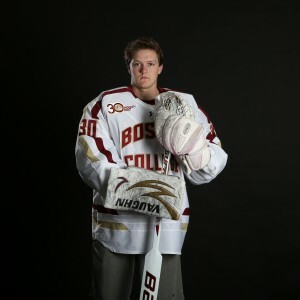 For comparison, in Schneider’s third and final year at Boston College, he posted a 2.15 GAA, along with .925 save percentage and six shutouts. Although Schneider’s numbers were better during his sophomore season, Demko’s 2015-16 stats trump Schneider’s best college numbers. Demko has flashed the potential to become one of the next best goaltenders in the NHL. He was the second goalie selected in the 2014 draft at 36th overall and is easily among one of the best goalies in his age group. 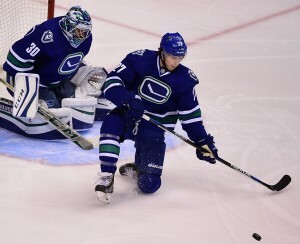 When the Canucks went to the Stanley Cup Final in 2011, their team was built from the net out, starting with Roberto Luongo. Demko could be that building block for the Canucks if the club is going to become a playoff contender in the next three to five years. With Juolevi further behind on the development curve, it is difficult to rank him ahead of Boeser and Demko as the Canucks best prospect. Although Boeser and Demko are almost equally as talented at their respective positions, the fact that it is harder to find a number one goalie makes Demko Vancouver’s best, and most valuable prospect.